Theorizing: Red Bulls Splitter/Stay imitating a Mass Damper? 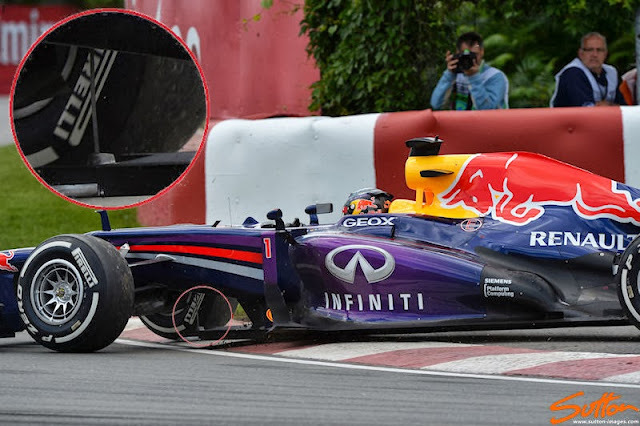 Red Bull's splitter was the topic of some debate at and beyond the Korean GP, I myself looked into the topic when many people on twitter quizzed me over the heat signature Mark Webber's car was showing on the FOM's new Thermal Imaging camera's. 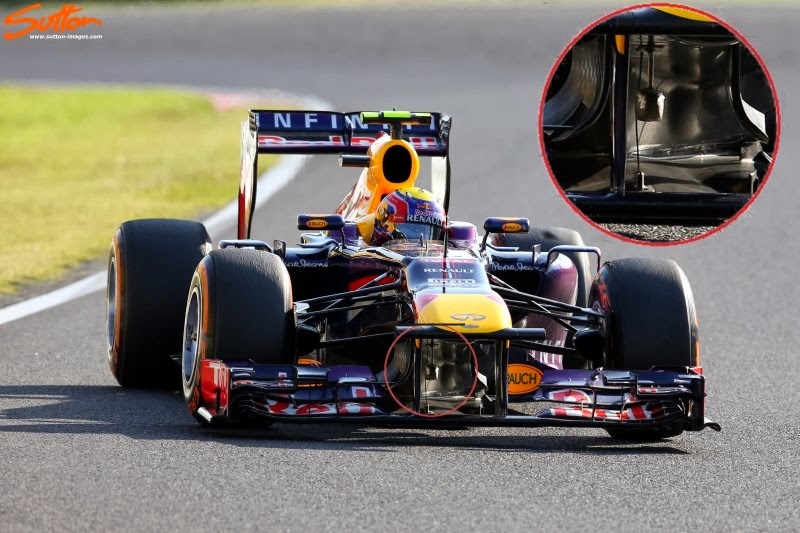 In the case of Webber the FOM had decided to utilise a rearward facing camera due to the Hammerhead positioning of the camera housing on the RB9. 2 weeks after my initial post on the topic and on the eve of the Indian GP, fellow Tech analyst Gary Anderson weighed in on the topic lending credence to my original analysis. On the back of this it seems the FIA were also keen to allay any fears that Red Bull may be gaining an advantage from heating the Splitter. Michael Schmidt of German publication AmuS reported that the FIA conducted their own test (in India), heating the front of the Splitter to 300o before performing their usual deflection test on the scrutineering rig. If you have read both mine and Gary's pieces you'd likely have concluded that we both believed that Red Bull were circumnavigating the deflection test by allowing the Splitter to heat up on contact with the track, transferring the heat to the stay and buckling it. This would effectively allow the Rake of the car to be increased and invariably make gains in downforce from the larger expansion area available at the Diffuser. The FIA's test disproved this theory but something about the whole situation continued to irk me and so although I have a mounting pile of articles that I have to write, I have spent days trawling through Sutton Images collection and reviewing footage. The thing that stood out to me the most when reviewing pictures of the RB9 was that the metal stay that forms the connection between the underside of the chassis and the splitter appears to be buckled. As you will see from the pictures below, the flexion shown in the Stay isn't consistent and appears to move when the car is in motion. But didn't the original Mass Dampers get banned? Yes they did, however the Mass Dampers of 2005/06 consisted of a spring mounted within the nosecone that utilised a weight floated within it (around 9kg's). The premise is that as the tyre deforms under load (without a Mass Damper) you lose both mechanical grip and downforce consistency. We have however all seen the slow motion replays in the past that show the amount of oscillation the tyres have as they ride kerbs, this oscillation has a frequency and if you were able to determine this frequency you could dampen it's effects. Tyres: As the car corners and exerts load into the tyres they begin to slip, if you can delay this slip then not only should you be able to extract more grip (by virtue of a bigger contact patch) but you will also over a sustained period see less degradation. Downforce: The damping of the chassis against the tyre deformation means that aerodynamically the car becomes more consistent, this of course means not only are Red Bull perhaps creating the most downforce on the grid, it isn't being spoilt by the natural movement of the car. The effects of resonance can be widesweeping and suffice to say that doing what I believe Red Bull have doing here would be beneficial in terms of both creating downforce and reducing drag. Having concluded that the Splitter is indeed in motion, albeit not being caused by the heat generated by the titanium skids transferring their heat into the upper face of the Splitter, we can now look at this with more certainty. The FIA deflection test is conducted in order to ascertain whether the Splitter moves upward as it hits the ground. What of course isn't tested is how much it droops when the stay resonates at the frequency of the tyres. The buckle that resides in the stay when it's at rest allows the stay to deform at resonance therefore moving not only vertically but perhaps also horizontally pivoting in the opposing direction to the deforming tyres. 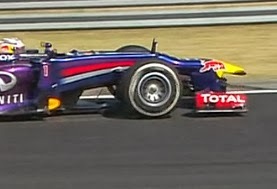 Braking: As the car decelerates the tyres deform, with the sidewall of the tyre squishing outward at the same time the stay would deform vertically, this also minimises the Splitter's interaction with the ground (which due to Red Bull's Rake angle it's already in close proximity) allowing a consistent level of airflow to pass over and under the splitter an onward to both the Diffuser and driving the airflow around the Sidepods. Turn In: Working in opposition to the tyres oscillation, the splitter and stay dampen the cars movements causing less rolling resistance and therefore hysteresis. As we know heat management of the Pirelli tyres is crucial in terms of degradation and so less hysteresis equals better degradation. As the tyres are having to perform less vertical work we can also assume that a net grip gain and loss of tyre slip is leveraged too. Apex Speed: Less resistance from the tyre and chassis equates to a more stable car and results in the driver being able to carry more speed through the corner. Top Speed: With the car able to carry much more speed throughout the cornering phase it's therefore conducive to the car being able to attain a higher top speed. A peculiarity in the case of Red Bull who in terms of setup always tend to favour the generation of downforce. If you have been following my work this season though you'll have undoubtedly noted how much Rear Wing angle the team have shed since the middle of the season. This is of course because downforce generated at the Rear Wing is 'dirty' and invariably comes with a much larger drag penalty than the downforce generated in the Diffuser. By reducing the wing angle and changing the gear ratios the team have been able to become fast not only in the corners but on the straights too. So what was all that about with the Splitter heating up on the Thermal Imaging camera? 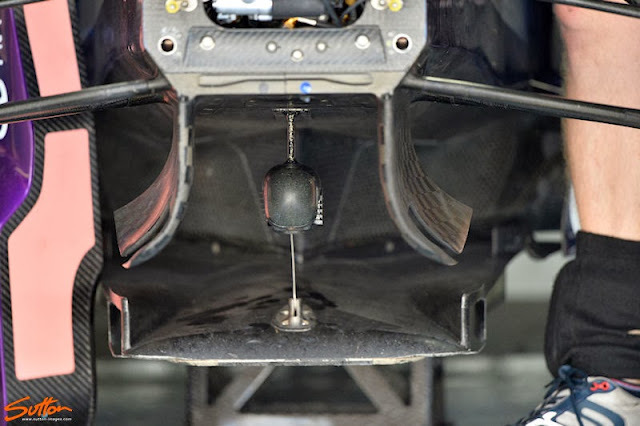 Red Bull as we know run an aggressive amount of Rake which means occasionally under braking etc the Splitter and the plank housed within it could contact the ground. If this were to occur over a sustained period it would mean the car would fail the post scrutineering check which allows 1mm of the plank to be worn away. The titanium skids are placed under the plank to stop this wearing from happening and in the case of Red Bull it appears the heat is then transferred into the upper surface of the Splitter and dissipated, like a heatsink. This is why we see the team putting drill marks in the upper surface too as it helps to increase the surface area and promote the direction in which they want the heat to dissipate. If we were to look back at the history of the original Mass Damper's in F1 we would of course know that Renault pioneered the device that was subsequently copied by others before the FIA banned it. It's a name though that we really should turn our attention to; Rob Marshall, Red Bull's Chief Designer pioneered the original Mass Damper when he worked at Renault. So it's no wild stretch then for the team to take advantage on an area of the car that worked so well in the past and redesign it for the prevailing trend / regulations / technology available. If you'd like to cast your mind back to this time last year I also posed the same question on the aeroelasticity of Red Bull's nose in creating a similar effect. Rarely in F1 do we truly see an new innovation, the boundary pushing is usually a team taking a pre existing idea and applying it a new way, this I believe is another case of just that. So if they are doing it, is it legal? Well only Charlie Whiting and the boys can truly determine that factor but as the Stay is allowable in the technical regulations and only need pass the upward 200KG deflection test on the rig I don't see why it wouldn't be. Although just like the original Mass Damper if it were to be found in use does it constitute a 'Moveable Aerodynamic Device'? Red Bull could argue just like Renault did that the device is moreover there to stabilise the car through harmonic matching. Why hasn't X,Y,Z copied it? Perhaps because they haven't noticed it, someone has to start a revolution for there to be one in the first place... (Renault started the last one, in terms of Mass Dampers) or perhaps they have but just haven't implemented it to the same level as Red Bull... Ferrari are their closest rivals who have a chance to, as they too run the metal Stay. Mercedes don't utilise a Stay, whilst Lotus use a Carbon Fibre one. I'm guessing Red Bull had the option to run this at the start of the season, then swiftly found that the tyre construction wasn't conducive to it's application or didn't yield as large a result as on the 2012 construction tyres. As we can see below Red Bull actually utilised a different stay prior to the change of construction mid season. 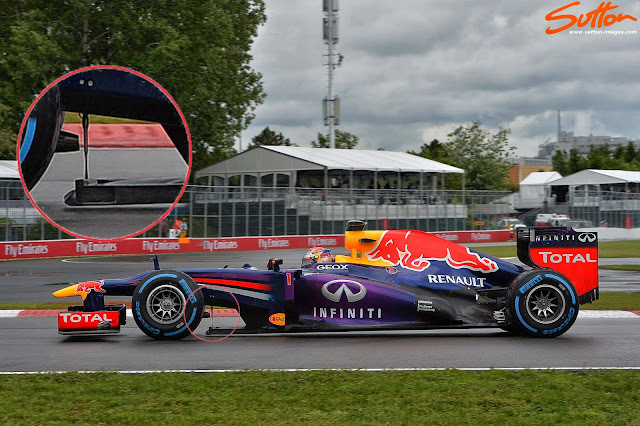 Above: This is an image from Montreal so before the change of construction, we can see here that Red Bull are using a much thinner stay, plausibly to glean the same effect as there is a small buckle visible in the stay. However take a look at how the car is riding the kerb and it's more likely the stay has done so purely under load. Above: Furthermore it's clear from this image that during Free Practice (Montreal) the team had a rig in place of the Stay. I'd suggest from the picture that this is an actuator capable of moving the splitter to assess any issues that could be created by using a harmonic stay. As always I have tried to be as expansive as I can with the resources available to me. Perhaps if I had access to some of the footage used by the likes of the BBC/Sky I could make an even more compelling case. I await your call guys.... and as always I invite your comments. Above: As shown in the .GIF above the stay broke on Vettel's car in Hungary, as pointed out by @Germyl barring Hungary Vettel has won 8 of the last 9 races, a coincidence? You would be quite correct in your assessment that teams have since the banning of Mass Dampers utilized a legal version which allows Mass Damping in the form of J-Dampers/Inerters. On this basis I'd conclude that although these do a job of damping the deflection/oscillation of the tyres, can it be improved? We have all seen from slow motion replays of cars riding the kerbs just how much deflection/oscillation the tyre under goes. 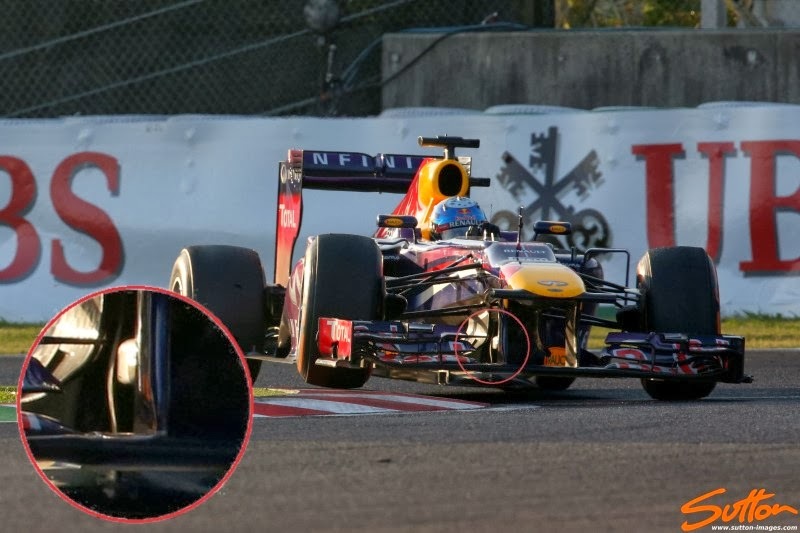 Perhaps Red Bull felt they could make gains with additional damping and thus this method was born. Presumably the 'stay' could be a misnomer anyway? If you can make the splitter stiff enough to handle the load test without a stay then you could put anything you like in there so it can wobble or deform freely. I personally don't think the stay is to prevent upward deflection at all, it seems to have very little strength in compression. I think the splitter is quite stiff enough to withstand the upward deflection test on its own. But I concede it's possible that the fibre is layered such to make the splitter flexible in other directions, such as horizontally, allowing it to act as a damper as you suggest. Perhaps a consequence of this is flexibility downwards under load and a tension stay is in place to prevent this at speed? Indeed the Splitter can be made so that it doesn't deflect, neither Mercedes or McLaren use a Stay on their car. The RBR splitter is weighted as it's constructed with a metal top surface rather than many of the other teams who run Carbon Splitters with space between it and the plank to house ballast. I believe that if we use the old Mass Damper as the reference the Stay can be seen as the Spring and the Splitter as the weight. The "ring" you mentioned in Canada FP they use it to adjust the flexibility of the wire that holds the "tray". Because in every circuit, the high that the "tray" works better, is different, this ring gives the Data in practice, and in race they take it of. Great article. 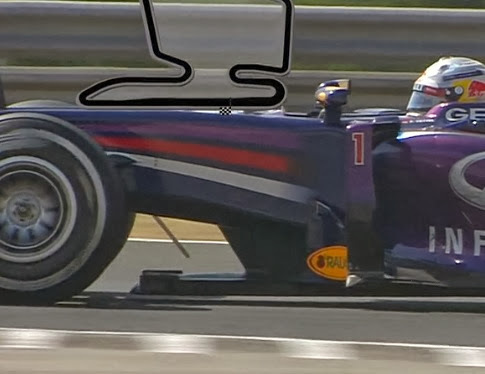 Regarding the drill holes on the splitter on Vettel's car and not on Webber's: this will affect the weight of the splitter. Will this change the characteristics of the damping if that is indeed what they are trying to achieve? Or are the holes still there to dissipate heat caused by the skid blocks? At first instance also I thought it is for heat dissipation, but, I remembered a Myth Busters episode, where they wanted to know if a car with the body like a golf ball is aerodinamically more efficient than a normal car: http://www.youtube.com/watch?v=LKxEkT2H8pI Could they gain any benefit from it aerodinamically? Wow, what a theory. Nice job. Did you take any look at all at the splitter (behaviour) of other cars? I mean, great to read that the Red Bull splitter does this and that under these and those conditions, but is there any (significant) difference compared to other cars to validate 'wild' theories on how Red Bull is circumventing the rules? But, when you say: "Above: As shown in the .GIF above the stay broke on Vettel's car in Hungary, as pointed out by @Germyl barring Hungary Vettel has won 8 of the last 9 races, a coincidence? " I have reviewed all the images that I have from Hungary race and I have not seen any pictures with broken stay. I think he didn't win the race because he had broken the front wing. Do you remember? He did indeed break the Front Wing in Hungary in the overtaking manoeuvre with Jenson, damaging the Endplate which drooped the Cascade onto the main wing stack. The car became un balanced after that and looked frankly difficult to drive. I wasn't aware he broke the Stay at the Silverstone test so thanks for the heads up. I've added some screen grabs from the Hungarian GP showing the broken Stay at the end of the article for your perusal. Matt, there is another device here as well...the bulbous object that appears to be in front? Is this just a camera or something else as it looks extraordinarily heavy to be where it is. I second that line of investigation: a heavy bublous objecto attached to the stay will increase the moving / damping effect. Sommers, would it be legal to connect the rear wishbone mounting with a mechanism that connected to the stay and would therefore move in relation to the front suspension. 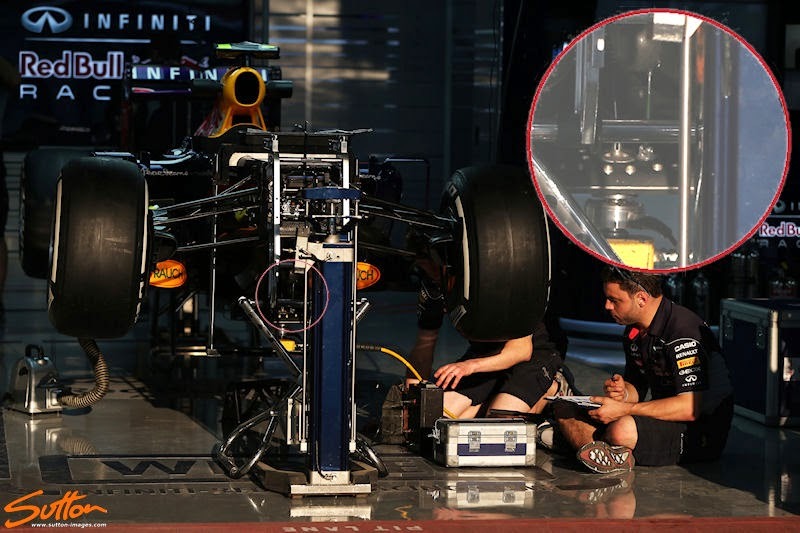 So for example the suspension under compression would 'lever' and pull the floor up? When under the deflection test the weight of the car could be enough to stop any movement. 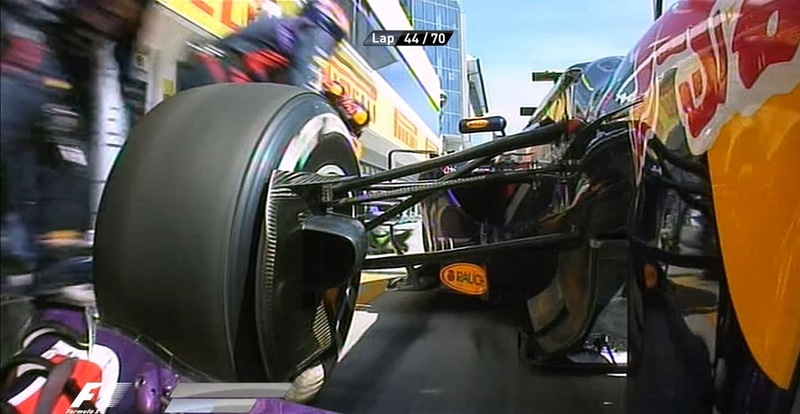 Anyone notice Webber's pit stop in today's US GP? As the car dropped down, at the end of the stop, the stay flexed. No idea if that's relevant here, I'm not that clued up, just thought it worth a mention. I can get you access to basically all of this years sky broadcasts, probably most/ all bbc. I studied your article carefully and I have a question about the role of the mechanical system composed of the splitter and the bulb (mass damper) located just above. Could you tell me if the plank can rotate (just a little) around a vertical axis relative to the ground ? I say that because I think the system (splitter + mass damper) would beusefull if the plank can have a lateral move (around a vertical axis relative to the ground) in a corner with centripetal force. Also, we would have a flow of air faster under the car and so a better downforce on the track. When the car goes out the corner, the centripetal force would be canceled and the system "splitter + mass damper" would be useful to cushion the plank and avoid a long oscillation. Please, what do you mean about this explanation ? Thanks and congratulations for your technical blog ! Hi and apologies for my late response, I do believe that the stay offers a central pivot point, please review the footage I've added from Interlagos this morning. Red Bull. Absolutely pushing the limit on every boundary. Its all aerodynamic black magic to me. I think the only other team that can compete with Red Bull on this is McLaren. Unfortunately, they allow operational inefficiencies and gross unreliability to let them down. after observing the video and picture, yeah it could be mass damper. making use of some flexible carbon bits on the chassis while the rest remain rigid to see-saw parts and make them work is really flexing the rules.